The Defence Research and Development Organization (DRDO) on December 20, successfully flight tested Lakshya-2, the Pilotless Target Aircraft (PTA), at very low altitudes. When PTA is operational, it is expected to be useful to enhance coastal security. 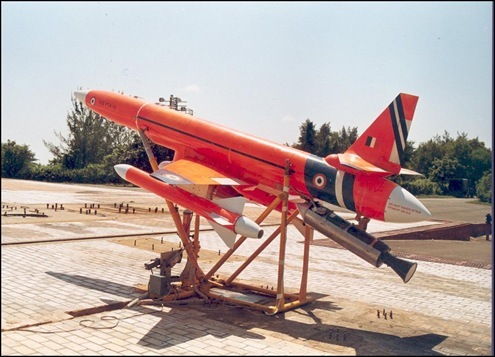 The Defence Research and Development Organization (DRDO) yesterday successfully conducted the flight test of Lakshya-2, the Pilotless Target Aircraft (PTA), at very low altitudes. The users have indicated their requirement of flying the PTA at 15 to 25 metres above sea level to simulate trajectory of low-level cruise missiles. Accordingly Aeronautical Development Establishment (ADE), Bangalore prepared Lakshya-2 with necessary hardware and software for meeting the user requirements. The flight test was of 32 minutes duration controlled by Ground Control Station and the low altitude flight was proved over 10km range. The flight was stable and well controlled. Mobile launcher to launch the PTA from anywhere and GPS to locate for recovery were used successfully. The pilotless aircraft also demonstrated its manoeuvring capability simultaneously simulating manoeuvring attacking aircrafts. The system has been designed so that two Lakshya targets can be flown and controlled by the Common Ground Control Station.